Benfica and Chelsea met yesterday at the Luz to see which team would go through to the next stage of this season's Champions League. What we saw was a typical display of this competition, with the underdogs playing better football and the powerhouse withstanding one attack after another (and almost conceding a goal), only to score in the last minutes of the match in a quick breakaway. Benfica manager Jorge Jesus chose his expected eleven, with Gaitán and Bruno César on the wings, and Aimar behind Cardozo. On the contrary, Chelsea interim coach Roberto Di Matteo changed half his team and left Bosingwa, Cahill, Essien, Lampard, Sturridge and Drogba on the bench (with even Paulo Ferreira getting a highly unlikely nod), clearly stating his mission for this leg - and showing that every player in the Chelsea roster will have his moment. Chelsea's game plan was clear: sit back, soak pressure, lots of time on the ball (even if it didn't necessarily mean progressing up the field with it) and a breakaway, where possible. With Benfica wary of exerting their usual full-on pressure on the opponent's defensive line, Chelsea defenders and midfielders had numerous moments where they could slow the tempo of the game, annoying the Eagles' fans. 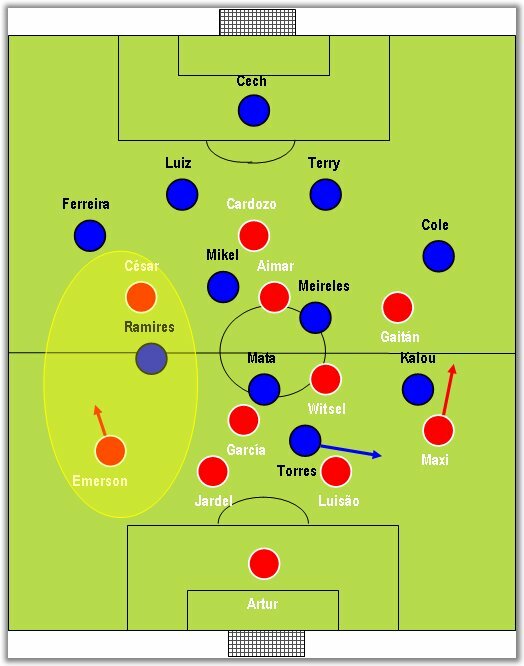 Di Matteo had clearly done his homework and played the more industrious and defensively aware Kalou on the left wing, in order to try to check Benfica's preferential attacking route - the right wing. Additionally, Torres was told to drift toward that space in order to take advantage of Maxi Pereira's bold positioning - and dragging his direct marker with him. Torres connects to the long ball behind Maxi Pereira, dragging Luisão with him. Kalou runs into the space his team-mate opened up. Here, Luisão tries to get back to his position and Javi García compensates his team-mate. As usual, Benfica attacked down the right, with Gaitán, Witsel and Aimar all taking turns to push up, trying to drag both Meireles and Mikel out of position - which they did at times, even though not as frequently as expected. The problem was the infamous weakest link: the left wing. Even though Emerson has taken a lot of flack throughout the season, it hasn't always been his fault, and last night was just another example. Ramires, playing to the right, but narrower than Kalou, helped creating numerical superiority in midfield and often tried to take on Emerson, since Bruno César (and then Gaitán, after his permanent move to the left) rarely tracked back, leaving acres of space for the Blue Kenyan to exploit (see the yellow area in the top diagram). As it turned out, that would be Benfica's fatal mistake. With both teams in similar formations, it would all come down to speed and creativity. Chelsea, as stated elsewhere, are much more calm and collected, and better organised, which meant they would be less vulnerable to breaking runs and counter-attacks. Paulo Ferreira was essential for the Londoners' newfound stability on the right, since he is much more reliable defensively and has a deeper understanding of a fullback's duties. The Eagles would have to step up for the second half. And that's exactly what they did. As it so often happens in the latter stages of this competition, the favourites were constantly subject to attacks during the second half's first 15 minutes, a period in which Benfica could (and should) have scored. Cech made great saves, Luiz bravely saved Cardozo's effort off the line and it seemed Chelsea's fortress was about to collapse. It was plain to see that the increase in speed from Witsel (showing that he is just the man Benfica needed for this sort of matches), Aimar and Gaitán (much better on the left) was making Meireles and - particularly - Mikel uncomfortable, especially because Torres was back to his old self, unable to hold on to a single ball. With Mata off his game (it's clear that he shouldn't start his moves from the middle), Ramires was the only out-ball the Blues had. Jesus was desperate to win the match and replaced Aimar and Bruno César with Rodrigo and Matic, meaning that Witsel would go right, Matic would take his place beside Javi García and Rodrigo would play just off Cardozo - and that's when it all started to crumble. As it has often been the case, Benfica's attempt to win the match unbalanced the whole team. Witsel's influence on the right was diminished and the Portuguese team started losing control. While Chelsea's goal was a recap of their strengths (experience, resilience, a more compact midfield and breakaways), it was also something that we have see too often in Benfica: their will to win at any cost often means that the team lose their balance. This would lead to Chelsea's goal. Notice how high up Emerson is, with no offensive coverage. After Ramires' impressive run, it's up to Torres to proceed. Matic shows once again he still has a lot to learn. The green arrow indicates where he should be providing coverage. There is one last issue being mentioned. Managers keep telling us that there is always some strategy behind their decisions, but it's sometimes hard to understand what it is. What's the logic in shuffling Witsel to the right, only to bring him back to the middle ten minutes later? Mind you, Jesus is far from being the only manager to do that, and we can only hope that some day we will get a straight answer to this question from a manager. The (rather unlikely) goal of the season?